I do like to think I have a healthy perspective as far as my personal limitations are concerned. My body has gone through some significant changes over the years. Some of them are self inflicted. Others are just evidence that I am not as young as I used to be. In 1986, I was 20 years old. I had finished an enlistment in the United States Navy and I was certain I would be the next Paul Stanley (with slightly less face paint). I didn’t look like a body builder but my body was somewhat toned due to my recent military tenure. I was ready to make my mark on the world with a guitar and a blow dryer (as I said, it was the 80’s). Time, of course, has a way of changing things. My guitar playing is sorely out of practice. I have long since retired the blow dryer. I didn’t so much retire it as it eventually died of boredom. My hair is now much shorter and greyer. I am also a little over 100 lbs heavier than I was in 1986 (file that under self inflicted). The effects of time and the excessive weight have had its consequences. I also have sleep apnea and high blood pressure. My rock star blue eyes now have the assistance of bifocal lenses. Let me put it this way – I have all but given up hope for a career as an Atlanta Braves home run hitter. Don’t work Hank Aaron. Your legacy at Turner Field is safe from the likes of me. Nevertheless, I try to take some of it in stride. I may not be as strong or as fast I used to be. But, I still have a chance to lose the excess weight and get myself in better health. I know I can’t completely turn the clock back on my physique. I CAN however wind up my figurative watch a bit better. In spite of the fact that many of you are too young to know what it means to wind a watch. My ego is not too bruised these days. Recently, however, my ego has been a bit harmed due to a recent injury to my shoulder. I initially thought I slept wrong on that arm. I figured a good hot shower and a nice massage from my lovely wife would help to correct this. I thought incorrectly. The pain remained to the point where it shot from my right shoulder blade all the way down to my right elbow.To move or rotate my arm was would prove to be painful. To lift my right hand over my head would prove to be excruciating. I tried to surmise what caused this injury since I had ruled out sleep position, My wife and daughter reminded me that I had carried a window air conditioner from my daughter’s room to the curb in front if the house. Both my daughter and my wife insisted that I see an orthopedic doctor. My daughter had also suffered a shoulder injury that had to be surgically corrected. Given that, I relented to her recommendation and my wife made an appointment for me. In the days that followed, my daughter helped me with some physical therapy (since she knew it all too well) and insisted I put an ice pack on my shoulder each night for a brief bit. My family has graciously endured my daily groaning. My daughter showed even greater patience and understanding as I referred to her as Lady Torquemada (due to the exercises and ice packs she provided me). The appointment finally came today. I was greeted by a nurse practitioner. She wore this lovely royal blue blouse. She had long flowing hair (imagine Farrah Fawcett without a curling iron). She wore dangling, but tasteful earrings. I thought to myself: maybe this wont be as bad as I imagined. I thought incorrectly. Nurse Farrah-Pretty-Blue-Blouse asked me some questions about my injury. She then began to move my right arm into a variety of positions. These were simple range of motion tasks. It was somewhat painful when she rotated my arm. When she placed my arm behind my back and gently pushed upward, it felt like a dagger piercing my shoulder blade. The pain I felt was too obvious for me to hide as my wife and kids who were sitting in the exam room with me. Nurse Farrah-Pretty-Blue-Blouse recommended physical therapy for me. She then offered me an injection of cortisone. She said this would reduce the inflammation after a few days. She pulled the needle backward to South Alabama and met my shoulder in New York. Once inside my shoulder, she decided to make stops in Syracuse, Utica, and Schenectady before making its way back to Rochester. Finally she gave me the referral form that indicated I had a rotator cuff injury with nerve impingement. So it was now official, I have injured my shoulder doing physical work and was treated with a steroid. Maybe I AM to be a professional athlete after all. Watch your back, Mr. Bonds. I may just go for home run 763. I only have to hit….763 home runs to make it happen. I had settled in my sister’s house quite nicely. My sister and her husband have a very nice finished basement which includes a TV with two recliners, a separate room with a nice pool table, and another separate room that has couple of dressers, a few knick-knacks, and a bed. The bed rests on a bed frame that has been in the family since around 1973. I can still vaguely remember when my parents bought it. Over the years, it was handed down to my sister who has had it ever since. The wood is painted dark black. It seemed gigantic when my parents first got it. That may have been because I was 7 years old and a runty kid. The bed frame looks nearly the same as when my parents bought it. I say nearly the same because there is one difference. The frame came with a post in each corner that is about 7 feet from the floor at its tip. About two years ago, my Dad was putting some things away in that room. Dad lost his balance and grabbed at one of the bedpost to break his fall. He not only broke his fall; he broke the bedpost. In the end, my father was unharmed and the bed became asymmetric. I still envision my parents putting it together whenever I look at it. I spent the next day with my brother from another mother — Stephan aka “Happy”. Happy and I hugged when I got to his place. We hugged again when I left. We spent pretty much every other second between those two points reminiscing about old times, bragging about our kids (whom are bound to collectively save the world), and point out how much the other has begun to age. After all, only a loving brother would point out that some apple juice, hair treatment, and some iron supplement would be worth some consideration. The following day was just as eventful. My sister has scored some tickets to see the Atlanta Braves play against the Pittsburgh Pirates. We left to go to the game. I couldn’t help but notice that my brother-in-law, Larry, was driving in the opposite direction of Turner Field. They eventually pulled into the parking lot of a hotel. My sister, Marlene, got out and entered the lobby. I patiently waited and chatted with Larry in the car. I saw Marlene coming out accompanied by a young lady. She opened the door and said: “Jenny, this is my brother —Shane.” Jenny graciously shook my hand. “It’s nice to meet you, Shane.” Suddenly, in the backseat next to me sat a man who looked me in the eye and “SURPRISE!” It was one of my closest friends from high school — Bill. Bill and I had not seen each other face to face in 25 years. Jenny, it turns out, is Bill’s lovely wife. My sister had planned to surprise me by having Bill and Jenny come to Savannah and visit with me. I say she planned because I already knew about it. For starters, Bill had inadvertently let it slip when we chatted over the Internet the previous week. Also, I had recognized Jenny from pictures Bill had sent. I just wasn’t about to tell somebody’s wife that I recognized her from the pictures I saw on the Internet. Bill and I kept mum until we were about half way to Turner Field. After all, I didn’t want to ruin the surprise for Marlene. Now, I had looked forward to this game since I bought my plane tickets 3 months prior. Reuniting with Bill was icing on the cake. We even took a picture together with the bust of Hank Aaron. I mean, c’mon. When you have three Georgia legends side by side, you MUST get a picture. It was shortly after this that things changed. A few drops began to fall. Suddenly, it was pouring. We ran to the gift shop and Bill scored us all some rain ponchos. 81 minutes later, we all headed to our seats. A talented chorus of kids from Dacula Middle School sang “The Star Spangled Banner”. The Braves lineup was introduced. The stadium was full of fans waiting with bated breath for the game to start. Then, it happened again: drip, drip, drip. The grounds crew began covering the field with tarp again. About halfway to the hotel where Bill and Jenny were staying, we found the game on the radio. It was clear the commentators were getting quite tired as they kept fumbling their words. Finally, at 12:32 AM, the Braves finished the inning and finalized the score of 7-3. As of this writing, the Atlanta Braves are at the top of the National League East. 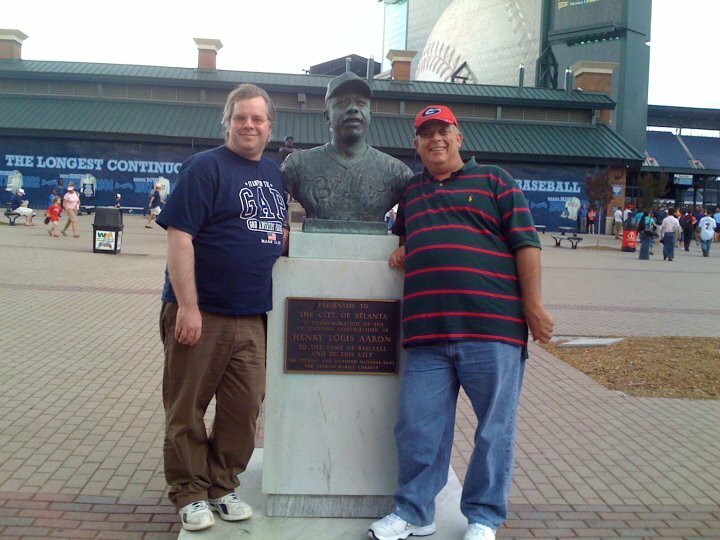 I knew there was something special that night when Bill and I took that picture with that bust of Hank Aaron. When you get three Georgia legends in the same place, you KNOW it’s going be fun.